South Africa will on Friday officially pay tribute to its men and women in uniform when the country’s first Armed Forces Day is held in Pretoria. The event has been split into three sections starting with a wreath laying ceremony at the SS Mendi Memorial at Gamothakga Resort in Atteridgeville followed by an amended brigade in review parade at the Lucas Moripe Stadium. The final component is a celebration programme at the stadium on the corner of Maunde and Hlahla streets in the Pretoria West township. This will show the public what the SA National Defence Force’s (SANDF) capabilities are in the form of demonstrations, air drops, flypasts and other military activities. The concept of a South African Armed Forces Day was first floated in 2010 when President Zuma addressed a gathering of soldiers, veterans and VIPs in the Thaba Tshwane town hall. 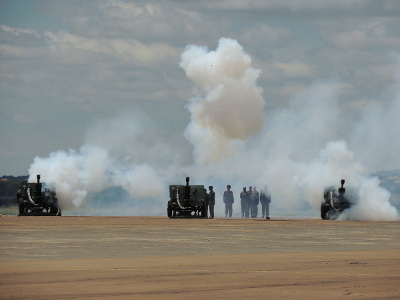 The hastily re-arranged venue was necessitated by a downpour that scuppered a parade, flypast and demonstration of military hardware and precision drill scheduled for the nearby Thaba Tshwane sportsgrounds. The following year, despite statements to the contrary by a senior SANDF spokesman, there was no Armed Forces Day. Head of communications Siphiwe Dlamini said at the time discussions would be held with the Department of Arts and Culture aimed at making Armed Forces Day an annual event on the national calendar. Last year indications were Armed Forces Day would coincide with the SS Mendi commemoration service in February. This did not happen. There was also no official commemoration or parade to mark the centenary of the SA Army last year. It now appears the commemorative day is back on track with SANDF director: corporate communication Brigadier General Xolani Mabanga indicating SANDF Commander-in-Chief, President Zuma, “is expected to be the main functionary at the inaugural Armed Forces Day, the first of its kind in the country”.